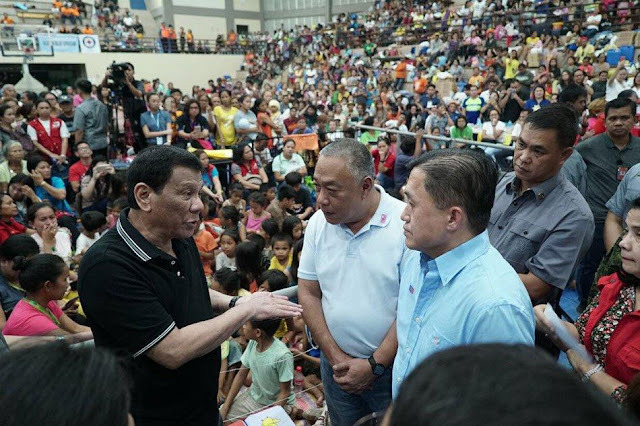 TATAK DUTERTE - Sympathizing with the victims of the massive landslide incident in Naga City, Cebu, President Rodrigo Duterte in his remarks on Friday pledged to assume hospitalization and burial expenses to the affected families should reluctant Mining companies refuse to do so. "Mangita ko'g kwarta. Ako nay mupalubong sa tanang namatay. Ako nay mugasto. Akoy mubayad sa hospital kung di na mubayad ang mga minahan (I will look for money. I will shoulder the burial and hospitalization expenses if the mining companies will not pay them)," Duterte told the evacuees confined at the East Poblacion Barangay Hall in Naga City. 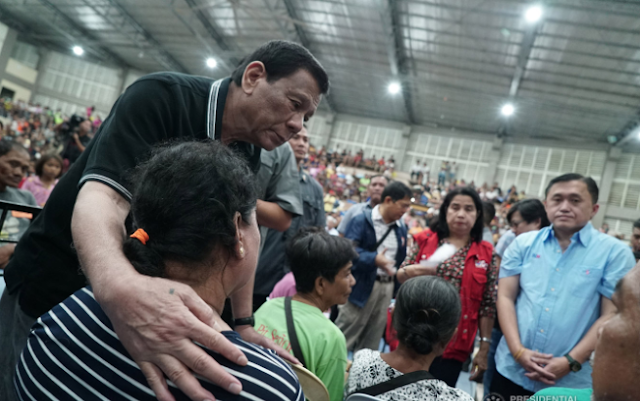 The President personally went to Naga City to have a glimpse of ground zero and pay the victims a visit on Friday whose homes were shrouded with thick soil soon after a section of a mountain abruptly collapsed in Barangay Naalad, Barangay Tina – an and Sitio Sindulan. Search and rescue operations in the area persists as death toll rises with at least 33 confirmed dead, while 9 others were left injured reportedly as of 5pm, Friday, September 21,2018. Several others were believed to be buried alive in the rubble. Duterte also persuaded the evacuees to no longer hope in going back to the area which have earlier been tagged as landslide – prone and instead consider the alternative of being relocated to a safer area. "Ang mayor (Kristine Chiong) mismo dili na musugot nga mubalhin mo didto. Ang inyong gobernador niingo’g delikado. So si General [Roy] Cimatu ug si General [Eduardo] Año ingon sila nga, 'Dili na gyud na sila makabalik.' Dili tungod nga gusto nilang samuk-samukon inyong kinabuhi kung dili para matagaan mo’g proteksyon, (Your mayor herself doesn't want you to go back. Your governor said it's dangerous. General Cimatu and Año also said that you cannot go back to the area. This is not to make your lives worse, but to protect you)." Duterte said in vernacular. He also added saying that Naga Mayor Kristine Chiong and Cebu Governor Hilario Davide III are already confabulating about the possibility of relocating the victims as they have already identified a vacant lot owned by the Provincial Government, located less than 1 kilometer from Sitio Tina – an as potential resettlement site. "Paanhion nako si (Housing and Urban Development Coordinating Council chairman) General (Eduardo) Del Rosario. Siya man to akong gitahasan nga maghimo'g balay-balay o cottage sa Marawi...Ingon una lang ang akong mahatag sa inyo...Basta may kapuy-an, may atop, may balay, (I will ask HUDCC Chairman General Eduardo del Rosario to come here. He was the one tasked to build cottages in Marawi...I can give you those types of houses...The size doesn't matter as long as you have a place to live in)." 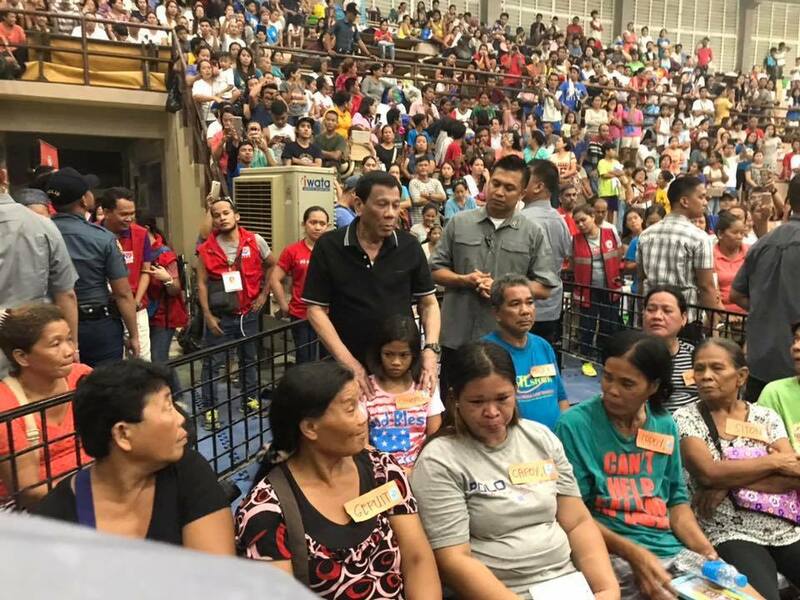 Duterte told the evacuees. President Duterte, who have previously been the subject of condemnation against God and the church, somehow encouraged the victims to ‘keep their faith in God’ saying that there are things we are no longer in control of but to accept the fate especially those who perished in the unforeseen incident. "Ibutang nato atong faith sa Ginoo. Wa na man gyud tay mahimo. Naa na man na...Ang ginoo ray kahibaw kung kanus-a ta mamatay. Kadtong atong mga kaigsuonan intawon, wa to sila kahibaw nga tapos na sila anang adlawa, (Let us put our faith in God. We can't do anything. It already happened...Only God who knows the day we will die. Those who passed away, perhaps they don't know that their lives are going to end that day)," the Chief Executive lamented. Meanwhile, affected families of the landslide incident puts the blame at the relentless quarrying operations perpetrated by Apo Land Quarry Corporation as the root cause of the catastrophe, decrying negligence from their part. Visible surface cracks were already prominent prior to the incident on that fateful day of September 20, 2018. Duterte also vowed to work on ceasing mining operations in the country before considering retirement. "Ibawal nato na. That's the only way nga akong buhaton una ko munaog pagkatrabahante sa gobyerno (We will prohibit mining. I will make that happen before I step down from office)," Duterte implied.